What is this strange astronomical formation? A more fanciful interpretation is that it's a vast cosmic eye, but then its official designation - planetary nebula - isn't much more helpful, considering it's neither a planet nor even really a nebula. 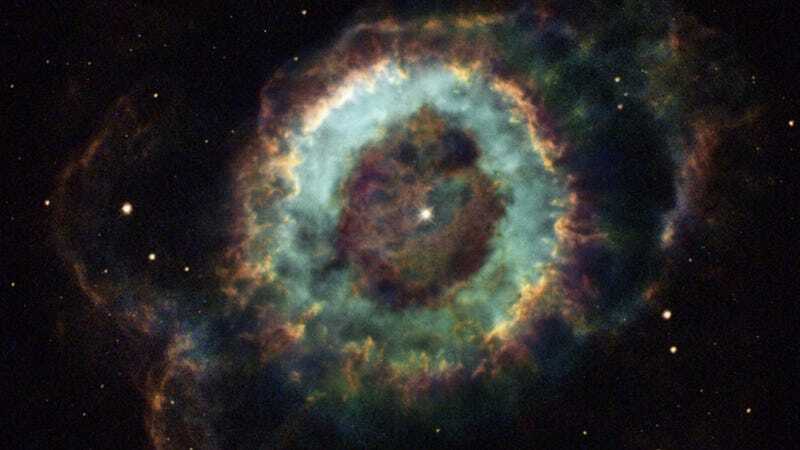 In reality, the Little Ghost Nebula, or NGC 6369 if you want to keep things nice and formal, is a glimpse into our own Sun's future. Stars that aren't big enough to go supernova simply expand outwards once they run out fuel, finally contracting into a tiny, ultra-dense white dwarf. That bright white dot at the center of the nebula is that newly forged white dwarf. Planetary nebulae picked up their name because, well, they sort of look like a gas planet. That's maybe not the most rigorous way of naming a cosmic phenomenon, but you'll have to take that point up with William Herschel. Herschel, who gained lasting fame for discovering Uranus, was the astronomer who named this general phenomenon and spotted the Little Ghost Nebula. It, like all planetary nebula, is a fundamentally short-lived phenomenon. After just a few thousand years, which is basically nothing in cosmic terms, the ionized gas around the star will fade, leaving only the white dwarf behind. That's what sets it apart from your more typical nebulae, which last millions of years as they forge new stars. That, of course, is another key difference - regular nebulae herald the birth of new stars, while planetary nebulae are a brief, brilliant epilogue to the life of a Sun-like star before its new existence as a white dwarf begins. The transformed white dwarf star, seen near the center, radiates strongly at ultraviolet wavelengths and powers the expanding nebula's glow. Surprisingly complex details and structures of NGC 6369 are revealed in this tantalizing image composed from Hubble Space Telescope data. The nebula's main ring structure is about a light-year across and the glow from ionized oxygen, hydrogen, and nitrogen atoms are colored blue, green, and red respectively. Over 2,000 light-years away, the Little Ghost Nebula offers a glimpse of the fate of our Sun, which could produce its own planetary nebula only about 5 billion years from now. You can click on the image up top for a larger view.